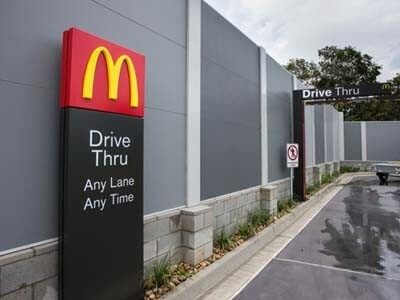 Modular Walls supplied their AcoustiMax 75mm panels for a boundary wall application at the rear of the McDonald’s restaurant in Sandgate, Brisbane. Bordering a railway line, the restaurant needed a wall that would serve the dual purpose of providing sound attenuation from passing trains as well as offering visual security for both boundaries. The wall needed to be 3m tall and mounted onto a block wall. This required an engineering assessment to be undertaken to design a suitable and invisible receptor to attach the posts to, as well as consider the imposed loads the wall and wind actions would apply to the block wall. A VogueWall utilising Modular Walls’ AcoustiMax 75mm panel was selected as it could exceed the acoustic attenuation as well as achieve the 3m height requirement. The boundary wall was painted to match with the colour scheme of the restaurant.